RICHMOND, Va. – Mary O’Melia left Ireland for America as a young widow with three children before she was hired as housekeeper at the White House of the Confederacy. An intimate witness to history, she also has been much of a mystery. That was until this year, when a woman with a distinctive Irish lilt to her voice called The American Civil War Museum. The housekeeper, the woman said, was related to her late husband, and she had in her possession a necklace that Confederate first lady Varina Davis gave O’Melia. 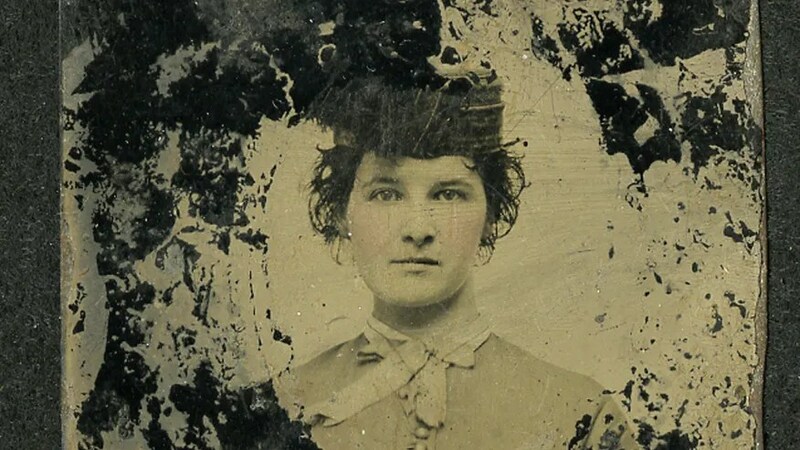 “What really took my breath away is she said she had a photograph of Mary,” said Cathy Wright, curator at the Civil War Museum, formerly the Museum of the Confederacy. “Considering that it’s been almost 150 years since she left the White House that anyone has been able to look at her face is just remarkable,” Wright said in an interview. The tintype adds a human dimension to what is a tantalizing but frustrating portrait of a woman who left her children in Baltimore to oversee the White House in the capital of the Confederacy during the duration of the Civil War but publicly revealed little of the experience. O’Melia was among a staff of 20, was a confidante to the first lady, and may have been in the mansion in April 1865 when President Abraham Lincoln visited after Confederate defenders left the city smoldering. Historical records are unclear on that point. The discovery is important nonetheless because the museum, which is next door to the White House, has strived to piece together the often untold lives of the African-American slaves, free people of color and European immigrants who worked as domestics for the Davis family. “One of the more elusive figures was Mary O’Melia,” Wright said. O’Melia was a central character in this Southern version of “Downton Abbey” and she remains a bit of an enigma. Even her name is a mystery. It’s been spelled various ways through the years — O’Melia, O’Malley and O’Malla. This much is known: she was born Mary Larkin on April 7, 1822, in Galway, in western Ireland. She was educated in a convent, and apparently the fine needlework the religious order of nuns taught her may have influenced her hiring by Varina Davis. She married a ship captain, Matthias O’Melia, but was widowed at age 25 when he was lost at sea. While the circumstances of her journey to America are not known, Mary O’Melia settled in Baltimore in about 1850. In 1861, she left her children with relatives and headed to visit friends in Richmond, where she was marooned when Virginia left the Union. Told by friends Varina Davis could help her return north, she appealed to the Roman Catholic bishop to intercede on her behalf. Ultimately, Davis prevailed upon O’Melia to take the position as housekeeper and companion to the first lady despite O’Melia’s separation from her children. O’Melia would eventually remain at the Confederate White House until Richmond’s fall in 1865. Despite her perch within the Confederate seat of power, O’Melia left little written accounts of her years in Richmond. She left it to others to speculate on her employment, including a reporter who wrote after her death of all the “exciting conferences” she would have witnessed. When the first family left Richmond in April 1865, O’Melia remained to oversee the mansion. Perhaps a more telling gesture of O’Melia’s connection to the first family of the Confederacy was her correspondence with the Davis family after they parted and a wedding she and Varina Davis attended in 1867. They were the only white people in attendance at the wedding of Ellen Barnes, who had served in the White House. Wright said O’Melia’s story resonates particularly with her because she calls herself the “modern housekeeper of the White House of the Confederacy. “I’m supposed to be over there keeping it clean and maintaining it so I’ve always felt a personal affinity for her,” she said. After her service at the White House, O’Melia returned to Baltimore where she operated boarding houses until her death in 1907.